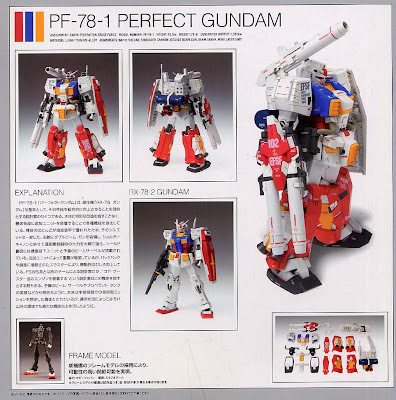 This is the expensive Gundam Fix Figuration of Perfect Gundam (PF-78-1) produced by the master Katoki Hajime. The Gundam FIX Figuration (aka G.F.F.) 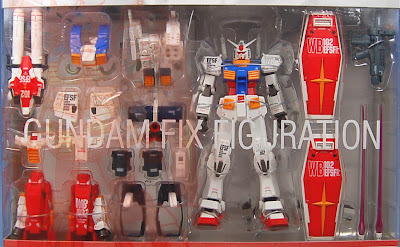 series of collectible figures was started based on the Gundam mechanical designs of Hajime Katoki and his 'Gundam FIX' illustration artbook and are released by Bandai. These figures share similar features as those found in the MSiA series, but are considerably more detailed and often include more accessories. Changeable parts and variant models are often utilized throughout the line, offering the collector a wide variety of display abilities. The collectible figures use PVC (with some ABS plastic) for construction materials, and a recently introduced expansion to the line use metal in the skeleton of the figure. Gundam FIX figures are designed to be true to Hajime Katoki's vision, and as such often adopt design elements and styling found throughout his artwork. The Fix series caters to Gundam fans who enjoy the scale, possibility and durability of the MSiA line, but seek the extensive details and variations that can often only be found in the Master Grade Gundam model-kits. The scale is basically the same as 1/144 HG kits (about 5 inch tall) and the price is 4,500 yen (about SGD 69.00) for me personally it is expensive but then again all those price is for all the nice painting job and all those extra detailing and decals stamped all over the model. The 2 photos above are taken from Hobby Search online shop. End of Part 1, we will continue more with the action pose in Part 2 tomorrow. Stay tuned to Shewsbury Land.